Remember Milton from Office Space? That poor guy. 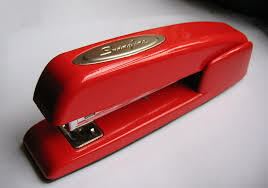 All he wanted was his red stapler to stop getting taken. AND, they kept moving him to the basement, AND, he stopped receiving his paycheck. I hate to spoil this movie for you, even though I’d have to imagine everyone has seen it, but let’s just say, neglect is a primary ingredient for sabotage. Once you know that your hiring process allowed a saboteur to get through the screening process, how do you make sure that the rest of your workforce is on the up and up without insulting those of higher values and morals? I suspect strongly that the majority of employees will also want to make sure that there are no additional internal saboteurs. After all, the mission they hopefully feel so aligned with is at stake, and so is their job, essentially. But at a larger organization, there are, statistically speaking, going to be those who feel like they have earned trust and may feel as though measures to test trust are for other people who have not yet proven themselves trustworthy. Another objection will be any time it may take, especially in organizations like Elon Musk‘s that are already stretching their workforce very thin. You have to be able to make the argument that everyone is subject to same evaluations, including the top level. As with everything else these days, transparency is the key to earning buy in from your talent. I mean, someone who has an inherent bias isn’t necessarily somebody who will commit corporate espionage, and bias itself is human. It’s when bias is used to make decisions that it becomes a problem. How many people could you really afford to lose all at once if your evaluations determine that the screening process let in multiple people? How much do you really want to know? Some people will leave before ish hits the fan, because every day will feel like a witchhunt, and even if they have done everything up to snuff, they might still wonder if a standardized test, which many have good reasons to be skeptical of, will pick up something anomalous. The evaluation for this situation is a core value assessment, but it’s usually given during the interview process, not after your workforce is onboarded, let alone tenured for any significant amount of time. As for which are the best for weeding out potential troublemakers in your workforce? Plus, do you even need an assessment or survey when your Glassdoor profile clearly expresses employee concerns? Even if your Glassdoor profile isn’t accurately reflecting employee concerns, what would it take to be properly alerted to fringe behavior, but still maintain a culture that keeps talent engaged? It comes down to resetting your culture. In a radio interview on Executive Leaders Radio that I was invited to observe, Shal Jacobovitz, CEO of CiVi BIopharma, put it simply – talent issues are either based on will, skill, or values. As a leader he can develop skills and inspire will, but when issues were due to a mismatch of values, they had to part ways. In my professional opinion and based on logic, you can’t expect that your whole workforce will comply with a values evaluation without diminishing your culture and trust at a critical time when trust really needs to be rebuilt. The best way to lessen the chances that any individuals within your workforce inclined toward altruistic punishment are more inclined to leave peacefully, be rehabilitated, or identified and fairly eliminated without incident is to reset the culture to be based on commitment to the mission, shared values, and mutual trust and respect. Core Value Assessments don’t do this, though they can help you hire people more in alignment, but engagement surveys might, as long as data remains anonymous and transparent action is taken to address workforce complaints and suggestions. If suspicious activity is identified by employees, there needs to be a TRULY anonymous channel people can use and a thorough due diligence process to validate any claims. Altruistic punishment can also be carried out between employees, not just from employee to employer. People will take matters into their own hands if they don’t feel they will be properly and adequately addressed. All people make mistakes. Good people make poor judgments sometimes. Don’t expect to rid your workforce of mistakes or poor judgments, or even bias; you can simply raise awareness around them and ensure that bias doesn’t drive decisions. Don’t punish employees for having opinions about how things could be better or feelings about how things are. Instead aim to cultivate a culture where people can be authentic and imperfect, where it’s safe to bring problems out into the open so that they can be resolved, and then make all reasonable efforts to resolve them. Be transparent about expectations and give people room to live up to them. Give them a reason to be their best, and show them faith that you know they will be. This isn’t fluffy hippie love I’m selling here – it’s science. In 1964, Harvard professor Robert Rosenthal conducted an experiment that proved that teachers’ expectations influence how students perform. It does no good to label an employee as a potential troublemaker. Consider them human, first, because if they really are a threat, they can still be threat to you externally, and how handle their opinions and feelings will determine just how much of a threat they stay, inside or outside. Acknowledge effort over intelligence, and you will get your best efforts from your workforce. 1st song off of Weezer’s Red Album! Now I decided “Whoa, this need lyrics” so I drank some coffee, broke five pencils, and let the copy and paste process do the talking. God, that was a lot of work! (No, I’m just being easy. lol) Here’s the lyrics!